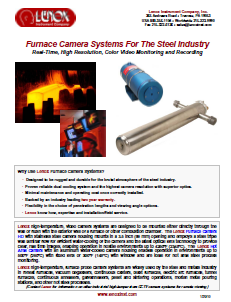 Lenox Instrument high-temperature camera systems provide clear, crisp images of the combustion process in boilers, furnaces, kilns, incinerators and other combustion chambers. With the real-time image provided, operators can monitor the proper flow of fuel and raw materials, reduce emissions, reduce fuel consumption, speed up boiler light off, and improve safety. Lenox high-temperature camera systems are performing reliably in hundreds of power, steel, paper, glass, and trash-to-steam installations. These systems are supported 24/7 and are backed by a two-year warranty.